Well fast forward to today and Andrew comes into work, gets situated and plops a Water Bobble in front of my computer and says "Here's your present!" What a swell guy! I had since figured out that the Bobble was what he was going to get me and I WANTED ONE!! Now, what is a Water Bobble you ask? 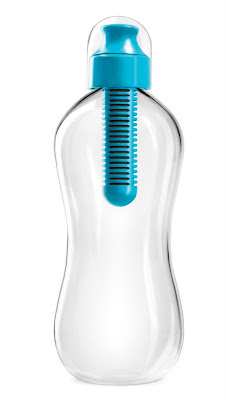 Well, it's a water bottle that filters the water as you drink! 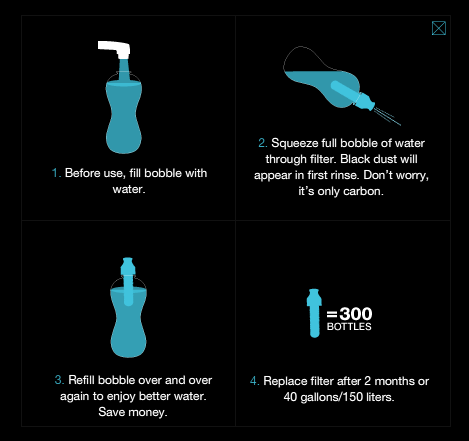 So basically you can get water from any faucet (even gas stations) and your Bobble will turn that yucky tap water into clean filtered water. How freakin' amazing is that!? Here's some previews of the Bobble, and I highly encourage you to check out their website, it's very nice! This one is like mine! The best part is they spent two years developing the idea and the design. Gotta love companies with good ideas AND good design aesthetics! The Bobble comes in an array of colors! AND when you replace the filter (every 2 months or so) you can change the color. You can get Bobble from Target, American Apparel, Barnes & Noble, and tons of other places, see Stores. Oh and another funny thing is I was in Target yesterday with my mom and I told her about that story of him telling me he got me a present, but then not buying it. How funny! I love my Bobble and thanks Andrew, you're a real pal! In "Bobble", "Bottled Water", "Facebook", "Target", "Water Bobble", "Water Filters"